Hello and welcome to exampundit. Here is a set of Analytical Reasoning Quiz for upcoming Bank Exams. assumptions and decide which of the assumptions is implicit in the statement. the farmers in the drought hit areas. courier service at a little extra cost. resulting into less crowd at ticket booking offices. holding fun fairs in the local football ground during the holiday season. alone are not sufficient to answer the question. statement I alone or statement II alone are sufficient to answer the question. I. N and T are younger than P.
II. M is older than R and P.
II. Hari is eighth from the right end of that row. I. ‘red and blue’ is written as ‘ho po da’ in that code language. II. ‘spread red carpet’ is written as ‘na da ka’ in that code language. 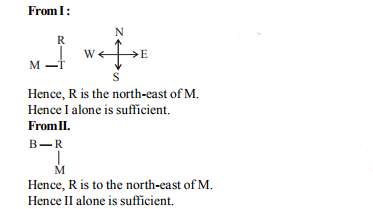 direction of village M ? 10. How many sisters does D have? I. D’s mother has four children. II. K and T are brothers of E.
will abide by it. Hence, both I and II are not implicit. the railway authority has been aimed at making the service-customer friendly. rather against the statement. Hence, I is not implicit. the abvoe assumption both I and II are not implicit. the code for ‘red’ is ‘da’. statements. Hence, both statements even together are not sufficient.